What is the period of GREAT TRIBULATION? WHEN will the time of great tribulation begin? Will the church go THROUGH the time of great tribulation? Are we IN the time of great tribulation NOW? These are the types of question that will be answered in this study based on what the WHOLE word of God has to say and not base on the opinions of men. In Matthew 24:21 Jesus tells us that there is coming a time when there shall be GREAT TRIBULATION upon the earth such has not been since the beginning, nor shall ever be again. And this time of GREAT TRIBULATION will occur or take place AFTER the ABOMINATION of DESOLATION spoken of by Daniel the prophet. "For THEN (AFTER or AT the time when we SEE the ABOMINATION of DESOLATION) shall be GREAT TRIBULATION, such as was NOT since the beginning of the world (or since the time man has been on the earth) to this time,(speaking of the time of the end when we the church shall see the abomination of desolation) no, nor ever shall be." The details describing this period of great tribulation are found in many passages of scripture throughout the Bible, but due to the vast number of these references, and there length, I have chosen to refer to only one more passage of scripture found in the book of Daniel in order to lay a Biblical foundation on which to build. The question of whether or not there will be a time or period of GREAT TRIBULATION has never been an issue or topic of debate among Christians. However, there is much controversy among Christians as to whether or not the church will go through the GREAT TRIBULATION period. There are some that believe that the church will escape this time of great tribulation by being taken out of the earth right before it begins. There are others, who believe that the church will go through at least part of the great tribulation but will be taken out of the earth somewhere in the middle before it gets really bad. This deliverance from this time of great tribulation, described as “being taken out of the earth BEFORE the time of great tribulation”, has come to be called the PRE-tribulation RAPTURE of the church. You see the prefix "PRE" before the word tribulation simple means BEFORE. Therefore the word PRE-tribulation simply means that the church will be taken out of the earth BEFORE the time of great tribulation in order to escape this time of GREAT tribulation. Now the "word" RAPTURE does not actually appear anywhere in the Bible, but the meaning of the word does describe an event, which the Bible teaches us that will in fact actually take place. The word “rapture” simply means to be caught up or caught away even to be snatched up by force. Probably the most referred to passage of scripture which describes this event of being CAUGHT UP is found in 1 Thessalonians 4:13-18. And sometimes 1 Corinthians 15:51-54 is also used to teach the RAPTURE of the church as our being CHANGED from mortal to immortal beings. Now it is not the purpose of this study to merely show that this event of being caught up and taken up from the earth is going to take place without a doubt, but actually to teach us WHEN this event will occur. Again, there is no denial of the fact that this event, which many believers call the RAPTURE of the church, will take place, but the controversy lies in WHEN the rapture of the church will take place. Again some Christians believe that the rapture will happen just prior to the beginning of the great tribulation period; hence this belief is called the PRE-tribulation view of the rapture. Others believe that the rapture will take place in the middle of the great tribulation period; thus this belief is called the MID-tribulation view of the rapture. Still other Christians believe that the rapture will not occur until after the great tribulation period, which is where the word POST-tribulation comes. Where you taught something other than these three points of view? Will the rapture of the church take place BEFORE the great tribulation period? Will the rapture of the church occur in the MIDDLE of the great tribulation period? Will the rapture of the church happen immediately AFTER the period of great tribulation? In order to answer this highly controversial question of WHEN the rapture of the church will occur with a SOUND BIBLICAL foundation we need only to look at a few KEY scriptures. "But I would not have you to be ignorant, brethren, CONCERNING them which are ASLEEP, that you sorrow not, even as others which have no hope. 17. THEN we which are alive and remain shall be caught up TOGETHER with them in the clouds to meet the Lord in the air; and so shall we ever be with the Lord. From this passage of scripture I want to draw your attention to three specific TRUTHS. There are many more truths in this passage of scripture, but for now I only want to focus upon these three. The first truth is that there WILL DEFINITELY be a RESURRECTION at the time of the rapture. This resurrection will only be a resurrection of the dead IN Christ (meaning a resurrection of ONLY faithful Christians. In other words, sinners will NOT take part in THIS resurrection. We will talk more about this later.). The third truth is that we, who are alive and remain at the coming of our Lord, will be caught up (or we will go up in the rapture) TOGETHER with the dead in Christ who have just been resurrected. Now let’s look at the passage of scripture to see exactly how I have arrived at these truths from the word of God. This phrase is a definite statement of fact that there is going to be a RESURRECTION of the dead IN Christ. AND we are also told two other import things in this verse. Number one that the dead IN Christ shall RISE first, meaning that ONLY the dead IN Christ shall take part in this RESURRECTION when Jesus returns. And number two that the dead IN Christ shall rise or be resurrected FIRST. There is NO other way to interpret this verse of scripture any other way than to say that there WILL without fail be a RESURRECTION of the dead IN Christ AT the TIME of the RAPTURE of the church. So then, here is definitely, without a doubt going to be a resurrection of the dead in Christ. Does everyone see this clearly and plainly FROM the word of God that there WILL BE a RESURRECTION of the dead IN Christ AT the time of the RAPTURE of the church? Now let us back up a few verses where we read in verse 14 that the spirits of those who sleep, which means those who have died IN Jesus (the dead IN Christ) God will bring with him. We are also told in 2 Corinthians 5:6 that when we are absent from the body, then we are present with the Lord. The Bible teaches us that when we were created we became a living soul. What this means is that the real you is a spirit and soul being which lives in a fleshly body and the two together become a living soul. The soul is the part of man the connects the spirit to the body and is where the mind, the will, and the emotions come into being. So when a Christians dies, the inner man or spirit and soul leaves the body and goes to be present with the Lord to await the time of his or her change. And I personally disagree with some who say that we are a tri-une being made up of spirit soul and body and only the spirit goes to be with God when a Christian dies. I personally believe that the soul and the spirit or breath from God are connected and that the soul goes with the spirit to be with God until the resurrection, IF SO BE that the person was IN Christ when they died. The word of God says that he is able to destroy BOTH the BODY and the SOUL. In TRUTH the Spirit or the breath and LIFE is Almighty God. Sort of given to us on loan so to speak. For now lets us just leave it at that. We could spend a whole study time on this subject of the spirit, soul, and body. Anyway, this time of change that we are awaiting is when God will give us as faithful believers new glorified spiritual bodies that will not die. In other words, this time of our CHANGE is the receiving of the promise of ETERNAL LIFE. God's life will be given to faithful believers as their own at the time of this FIRST resurrection at the coming of Jesus where we are told that only the dead IN Jesus Christ are RESURRECTED. 1 Corinthians 15:42-55 gives us a great deal of insight on this subject of the RESURRECTION of the dead IN Christ as well as to the TIME that this resurrection and change, our being given ETERNAL LIFE will occur, but I will only quote the three verses of the passage of scripture. You can read the entire context later for your self, but for now I will just tell you that this passage of scripture teaches us about the RESURRECTION. Here is what verses 51 through 53 of 1 Corinthians chapter 15 have to say. "Behold I show you a MYSTERY; We shall not all sleep (that is to say, we shall not all die, in other words, some of us will remain and be alive at the time when this change take place), but we shall all be CHANGED. 53. For this corruptible must put on incorruption, and this mortal must put on IMMORTALITY.."
Now let’s compare these three verses with the passage of scripture that we have been looking at found in 1 Thessalonians 4:13-18. Both passages talk about a RESURRECTION of the dead in Christ, because ONLY those who are RIGHTEOUS will be raised INCORRUPTIBLE. Also both refer to those who sleep in Christ, because of the preposition "WE"; and those who are alive and remaining at the coming of the Lord, because WE shall not ALL SLEEP or die. So we can conclude that our change will come at the time of the RAPTURE. And we can also conclude that the rapture will occur at the time of the sounding of the LAST TRUMPET, what ever this last trump may be. But before I get too far ahead of myself let’s go back and finish laying the foundation of the three truths which I stated earlier. The word “prevent” here literally means to precede or to go before. Now precede means to go before in time, or occur prior to, or to go in advance of. In other words, this verse is saying we who are alive and remain unto the coming of the Lord are NOT going to be CAUGHT UP in the RAPTURE to meet Jesus in the air BEFORE the dead in Christ are resurrected from the dead. Plain and simple there is not going to be a rapture or CATCHING UP of believers, until there is FIRST a resurrection of the dead in Christ. "...and the dead in Christ shall rise FIRST." “And these all (referring to the dead in Christ) having obtained a good report through faith, RECEIVED NOT the promise (as yet). In other words, we don’t get caught up, UNTIL there is FIRST a resurrection of the dead in Christ. To put it another way, there will be NO rapture, UNTIL the dead in Christ are resurrected, and the dead in Christ don’t receive there immortal bodies or change, UNTIL we who are alive and remain receive our change. Plain and simple, we ALL receive our change TOGETHER at the SAME time, which we have now learned is at the time of the RAPTURE of the CHURCH. These verses of scriptures cannot be interpreted any other way. So this leaves us with the undeniable TRUTH that there can absolutely be NO rapture UNTIL there is FIRST a resurrection of the dead in Christ, and that those of us who are alive and remain unto the coming of the Lord will go up in the rapture or caught up TOGETHER with the resurrected dead in Christ. In other words, we don’t go up until the dead in Christ are resurrected, and then we will all be changed in a twinkling of an eye and we all will be caught up TOGETHER. Fix this TRUTH into your mind and in your heart, so that you will not be deceived. Now that a solid Biblical foundation has been laid let’s begin building a sound unshakable doctrine of WHEN the RAPTURE will take place. Sometimes the easiest way to explain something clearly is to draw a picture to illustrate the truth you are trying to make. 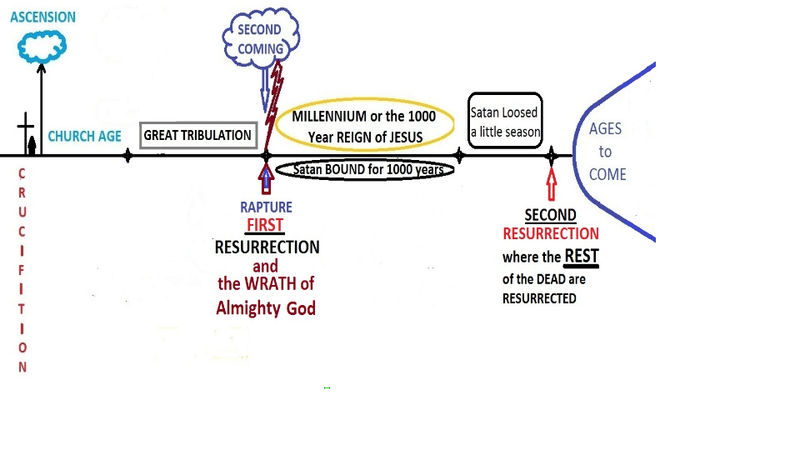 The following diagram is a common illustration of the PRE-tribulation view of the rapture. Now since we have clearly shown that the word of God without a doubt teaches the there WILL DEFINITELY be a resurrection at the time of the rapture, then it is needful that we include this vital truth to the drawing. So let’s place the word “resurrection” directly under the word RAPTURE on the illustration of the PRE-tribulation illustration, since they teach that the RAPTURE must take place BEFORE the time of great tribulation. "And I saw thrones, and they sat upon them, and judgment was given unto them: and I saw the souls of them that were beheaded for the witness of Jesus, and for the word of God, and which had not worshiped the beast, neither his image, neither had received his mark upon their foreheads, or in their hands; and they LIVED and REIGNED with Christ a thousand years. 6. Blessed and holy is he that hath part in the FIRST resurrection: on such the second death hath no power, but they shall be priest of God and of Christ, and shall reign with him a thousand years." First of all I know that the King James Version, because of the old English way of speaking does sound backwards at times. Just a light reading of verse 5 SEEMS like it is saying that the FIRST resurrection does not take place until the END of the 1000 year reign of Jesus. However, we KNOW that this cannot be the truth, because the dead in Christ who are resurrected live and REIGN WITH Jesus DURING this 1000 years. Also we see the word "REST" which teaches us that there is another resurrection at the END of the 1000 years where the REST of the dead are resurrected. Even though the King James Version has mistranslated this verse in reverse it is not the only translation that made this mistake. Even other newer translations copied from the King James Translation and also got Rev. 20:5 backwards as well. Some of the newer translations however do put parentheses around part of this verse to let the reader know that something is up and that the translators themselves were unsure of how to properly translate this verse. Now I have not looked at every translation there is, but I have found two that do in fact translate this verse CORRECTLY. There are many other translations that do place parentheses around the sentence (But the REST of the dead lived not again UNTIL the thousand years were finished. )This is the FIRST RESURRECTION, which lets the reader know that something is up and that the translators themselves were not quite sure as to how this verse was to be translated. It is not uncommon for translators to ADD words to the text to make it easier to understand. In the King James version these words that are added are in ITALICS to let the reader know that they were added for clarity. But even then some are MISSED in the printing and are not always in ITALICS. Anyway here is Revelation 20:4-6 from the New Readers International Version, which has CORRECTLY translated verse 5. "I saw thrones. Those who had been given authority to judge were sitting on them. I also saw the souls of those whose heads had been cut off because they had given witness for Jesus and because of God's word. They had not worshiped the beast or his statue. They had not received his mark on their foreheads or hands. They came to life and ruled with Christ for 1,000 years. 5. This is the first resurrection. The rest of the dead did not come to life until the 1,000 years were ended. 6. Blessed and holy are those who take part in the first resurrection. The second death has no power over them. They will be priests of God and of Christ. They will rule with him for 1,000 years." And here is Revelation 20:4-6 from the New Living Translation. "Then I saw thrones, and the people sitting on them had been given the authority to judge. And I saw the souls of those who had been beheaded for their testimony about Jesus, for proclaiming the word of God. And I saw the souls of those who had not worshiped the beast or his statue, nor accepted his mark on their forehead or their hands. They came to life again, and they reigned with Christ for a thousand years. 6. Blessed and holy are those who share in the first resurrection. For them the second death holds no power, but they will be priests of God and of Christ and will reign with him a thousand years." Now I want you to notice that there are two KEYS found in this passage of scripture that will settle in your heart forever the TIME that the rapture will occur. That is of course IF you truly desire to know the sincere undefiled TRUTH of God’s word, the WHOLE word of God. Both of these keys that unlock the truth are found in verse 5 of Revelation chapter 20. The word “FIRST” means coming BEFORE all others. Consequently this means that the resurrection described here in these verses in chapter 20 of the book of Revelation by simple definition HAS TO BE the resurrection that occurs prior to, or BEFORE any other resurrection. In other words, the FIRST resurrection is the very FIRST resurrection to take place, and there is NO other resurrection that will take place BEFORE the FIRST resurrection. Therefore since the resurrection that takes place at the time of the RAPTURE will also be the FIRST resurrection to occur since the time of Jesus. So consequently, this makes both of these references to a resurrection, to be ONE and the SAME resurrection. In other words, the resurrection described in 1 Thessalonians 4:13-18 is the exact SAME resurrection described in Revelation 20:4-6. There is no getting around this undeniable truth that they are ONE and the SAME resurrection, because there can only be ONE FIRST RESURRECTION. So then, now we must also add this vital truth to the PRE-tribulation drawing by placing the word FIRST before the word RESURRECTION that is directly under the word rapture to clearly illustrate this undeniable truth that the FIRST RESURRECTION will occur at the time of the RAPTURE of the church. other resurrection left to take place. Let me explain. If there were 8 apples on a table and I came and took 5 of these apples FIRST, before anyone else could come and take any, and would say to you, “I will return after the day is finished to take the REST,” how many apples would I take at the end of the day? Obviously the answer would be the REMAINING three, or ALL that is left. So consequently the phases “FIRST resurrection”, and “the REST of the dead lived not again until the thousand years were finished” do more than just imply that that there are TWO resurrections; they emphatically state that there are TWO and ONLY TWO resurrections that are going to take place. The FIRST resurrection as we have already clearly shown will take place at the time of the RAPTURE. This we have already shown to be an undeniable TRUTH of God's word. And Revelation 20:5 tells us that the second and FINAL resurrection, the ONLY other resurrection to take place will not take place UNTIL the thousand years reign of Jesus is finished, or at the END of the 1000 years. Now with this TRUTH soundly established let’s put the final touches on the PRE-tribulation illustration of the rapture by writing the words “Second resurrection where the REST of the dead are raised” at the end of the thousand years reign. Now read Revelation 20:4 again with this illustration FIXED in your mind. "I saw thrones, and they sat upon them, and judgment was given to them: and I saw the souls of them that were BEHEADED (or KILLED) for the witness of Jesus, and for the word of God, and which had not worshiped the beast, neither his image, neither had received his mark upon their foreheads, or in their hands: and THEY LIVED (or they were RESURRECTED) and REIGNED with Christ a thousand years." Remember the first rule of interpreting the Bible is to keep the verse of scripture that is in question in the context from which it is found. This verse is describing those who take part in the FIRST resurrection, which we now know without a doubt takes place at the time of the RAPTURE. Remember that the FIRST resurrection and the resurrection at the time of the RAPTURE are ONE and the SAME resurrection. There is NO getting around this UNDENIABLE TRUTH. Now if you haven’t already, I want you to notice that those who are being resurrected here in this FIRST resurrection at the time of the RAPTURE have gone through the entire GREAT TRIBULATION period. THEY did not worship the beast. THEY did not worship the image of the beast. THEY did not receive the mark of the beast in their foreheads or in their hands. THEY were BEHEADED, in other words, they were KILLED, or martyred for the witness of Jesus and for the word of God. THEY LIVED (that is to say, they were RESURRECTED, and the word of God PLAINLY states that this is the FIRST resurrection) and REIGNED WITH Christ for a thousand years. The Bible clearly teaches us that all these things that these beloved in Christ went through here is verse 4 took place DURING the time of GREAT TRIBULATION, which took place prior to or BEFORE the FIRST resurrection. So what does all this mean? Take one more CLOSE look at the illustration of the PRE-tribulation view. Now I want you to notice that there is a MAJOR problem with the illustration of the PRE-tribulation doctrine. Remember, the PRE-tribulation view teaches that the church will be raptured BEFORE the GREAT TRIBULATION period. However, as you can clearly see, by their very own drawing, that this simply cannot be the case. You can plainly see by this illustration of the PRE-tribulation view that the Bible clearly shows that a PRE-tribulation rapture is NOT POSSIBLE. Let me explain. If the RAPTURE were to take place BEFORE the time of great tribulation, as the PRE-tribulation doctrine teaches, then that means that the FIRST resurrection has to ALSO takes place BEFORE the great tribulation period. And why is this? Remember the firm BIBLICAL foundation that we laid earlier that there must be a resurrection at the time of the rapture, which is where ALL the DEAD in Jesus Christ are RESURRECTED FIRST. If the rapture of the church were to take place BEFORE the great tribulation, and the ONLY other resurrection to occur does not take place until the thousand years is FINISHED, then how will those Christians who were beheaded for the witness of Jesus and the word of God DURING the great tribulation period be resurrected in order to LIVE and reign with Christ for a thousand years? It is NOT possible with the PRE-tribulation teaching, nor is it possible with the MID-tribulation view. The ONLY BIBLICAL solution is to move the time that the rapture is to occur to immediately AFTER the great tribulation period. The Bible clearly teaches In Matthew 24:29-31 that the rapture of the church will in fact take place immediately AFTER the time of great tribulation. Now you are faced with a CHOICE of either to accept the TRUTH of the WHOLE word of God that clearly teaches that the church, believers in Christ, WILL go THROUGH the entire great tribulation period and will NOT be raptured until IMMEDIATELY AFTER the tribulation of those days just before Jesus executes the WRATH of Almighty God, OR you can REJECT God's word. The choice is yours. I pray that you will make the right choice, so that you can PREPARE for the days ahead. Please read the study entitled "HOW TO PREPARE FOR THE GREAT TRIBULATION"
30. And THEN shall appear the sign of the Son of man in heaven: and THEN shall all the tribes of the earth mourn, and they shall see the Son coming in clouds of heaven with power and great gory. Here is a drawing that I made to teach a Bible study at church. I could not find one anywhere on the Internet at the time so I improvised and made my own drawing. Keep in mind the the church age CONTINUES right on THROUGH the ENTIRE period of Great tribulation right up to the SECOND COMING of Jesus. The above drawing does not make this clear, but the word of TRUTH clearly teaches that from the day of Pentecost to the SECOND COMING of Jesus is the church age. In truth there has been great tribulation pretty much all throughout the entire church age, but in the last 3 1/2 years there will again be Great tribulation in the Middle East such has never before. The Bible say that those in Judea and surrounding countries should FLEE to the mountains for safety. The word "mountain" is also used to speak of kingdoms, so this verse could mean for those Israel and surrounding countries to FLEE to other more distant countries for refuge and safety when they see Jerusalem SURROUNDED by ARMIES. There is much more scriptural evidence that supports and reinforces the POST-tribulation rapture of the church TRUTH, which I have dealt with at some length in the study I have entitled “THE THIRD DAY”. However, the main purpose of this study is to determine when the great tribulation will take place as well as to focus on the attitude of God. The Bible is very clear in conveying to us that God’s attitude towards us is to save and protect us from our adversary, the devil. The coming of the Lord is very near, and Satan knows that his time is growing short. Therefore the wrath of the enemy will increase as the day of the Lord draws closer. The Bible without a doubt clearly teaches that the church WILL go THROUGH the entire period of GREAT TRIBULATION, but God desires his people to be PREPARED for the days ahead. I have a study on "HOW TO PREPARE FOR THE GREAT TRIBULATION" in which I will share with you on how to build your “ARK OF SECURITY”, so that you might be delivered and protected during the great tribulation period, and not cast away your confidence in the Lord. You may click on the highlighted blue title, which will link or open a new window to this study or you may scroll back up and choose another study. Thanks for reading and may the Holy Spirit of the living God our Father lead and guide you into all TRUTH. Search the word daily to prove to yourself that the things you are taught are in fact the TRUTH of God's Holy word, the WHOLE word of God.